Cats are natural predators that love to hunt. 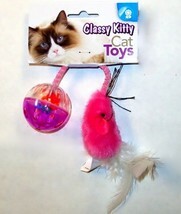 Toys are a great way to stemulate your cat's instincts. Change toys regularly to keep them excited about the hunt. Intended for pets only. Keep out of reach of children. Returns: We give you 30 day No questions asked for returns. Call for authorization. Full refund on the cost, Shipping charges are not refunded and customer pays return shipping. Items returned are to be unopened, no Damage, be in sellable condition, same item that we sent to you. Orders over 30 days will have a 25% Re-Stocking Fee. Over 60 days will be sent back to buyer.